A few weeks ago, Matthew warned he'd be notching up the volume/intensity, and this week he followed through on his promise. One on One Recap: Arms? Our first stop in this workout was thrusters. I didn't look at the weights Matthew had set out and figured they were the usual 15 pound weights I typically use on thrusters. At about 10 repetitions, I was tired, but Matthew kept counting. I got to 15 and I figured I was done, but Matthew says we are going to 21. 21? What? By the 18th thruster, I was getting visions of my arms collapsing and the weights dropping on my head. It took ALL I had to do the final two. 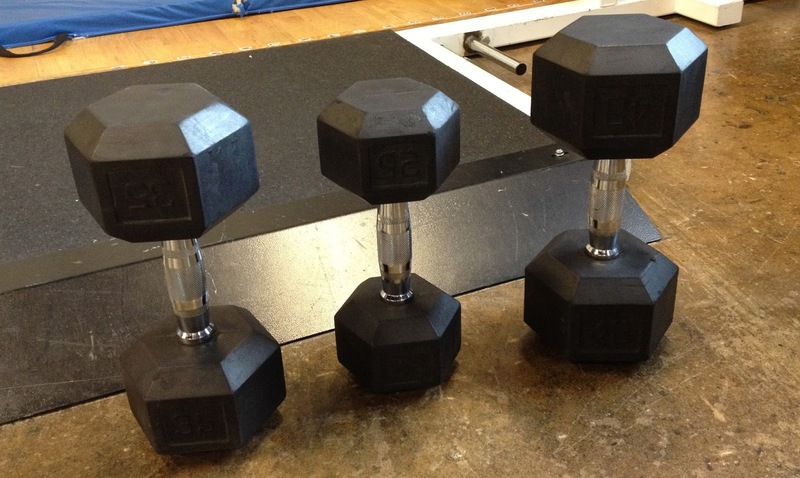 I looked down and saw the weights were 20 pounds. Sneaky. I ended up doing 3 sets of thrusters, the second set I did 15 reps and the third 9. Matthew kept reminding me to use the momentum coming out of the squat to help me get the weights up above my head. I needed that reminder. Pick a weight, any weight. We quickly switched to the ARx pulldown and did 5 continuous reps. My heart rate was up so high from the thrusters, I really kind of stumbled over. My poor arms. Fatigued already and it was early in my 30 minutes. From there, I had another quick change to knee ups. Matthew had me do 15 reps. I don't know what it is about those but they never seem easier and always make me feel like I have to go to the restroom. Sorry, but they do. Do they do this to anyone else? The fly of ab exercises: Knee Ups! 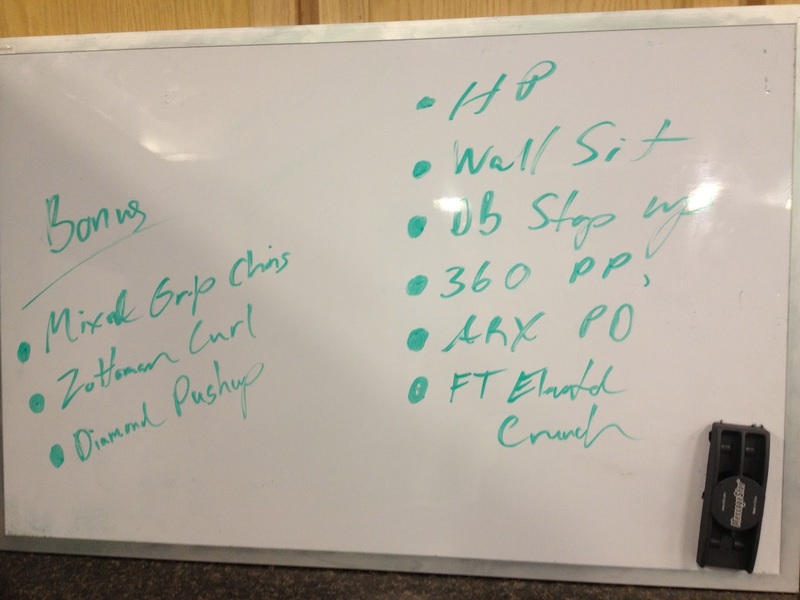 I did this circuit of exercises three times before moving on to a second circuit of ring rows and goblet squats. 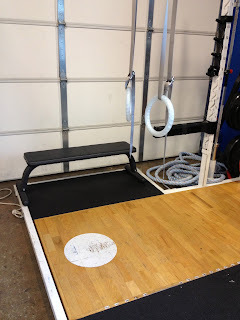 I had done some rows using the rings in a group workout before and they were challenging. They were no where near as challenging as what they were in this workout. Matthew had me do 40 reps. He had me do 10 reps orienting my hands 4 different ways in relation to the floor. By number 7 of each variation, my arms were burning. He reminded me to focus on pulling and pinching with my back. That was hard to think about at this point. Muse literally got me through this exercise. Madness was on the stereo and I can't disappoint Muse. Once I finished, I was getting a drink of water and saw Matthew hoisting a 50 pound weight. It was for me to do goblet squats with. I honestly couldn't feel my hands. 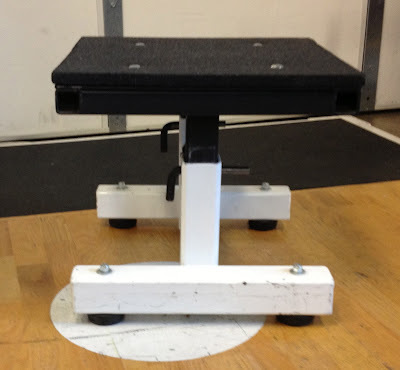 It was hard enough to just pick up the weight much less squat with it. About half way into my first set of 15 squats, I wasn't going as deep as Matthew would like, so he brought over a rubber brick for me to squat down to. I did that once and couldn't get up with the 50 pound weight. Lame. He says I shouldn't have relaxed at the bottom. He switched me to a 30 pound weight. This was still quite challenging, but I made it through. My reward was more ring rows. This time he had me do 20 reps -5 reps of each hand orientation. He said I could take a break, but I had to transition to a different hand position once before doing so. Deal. I made it through 2 transitions before I had to take a break. After finishing, I returned to the squats. After my workouts, I usually post something to Facebook about it. 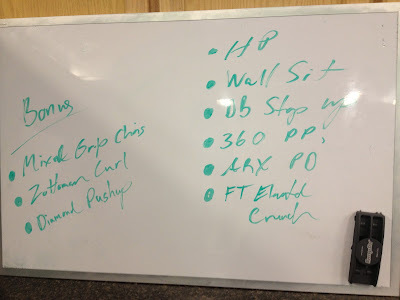 A new Primal Meet-up friend who trains with Keith Norris, said that it sounded like a humbling workout. That's exactly what it was. Humbling. What the one on one workout was for my arms this week, the group workout was for my legs. There was plenty of good arm work too, but it was felt more immediately in my legs. Me and my week 9 partner were partnered up again. Our first exercise in the circuit for me was the wall sit. I asked my partner to talk to me for a bit to distract me from the sit. That works wonders over a minute. From there we went to an exercise that is my nemesis: the step ups. I don't know why this is so hard for me. Is the height of the step? Are my legs weak? Is it a combo of the two? This step won't beat me. I started with a 10 pound weight. Matthew saw and said I should be doing at least a 20 pound weight. I tried. I had difficulty lifting myself onto the step. I switched to a 15 pound weight and struggled through the first minute. The second round through, I picked up the 20 pounds and did as many as I could, slowly, for about 30 seconds before switching to the 15 pounds. 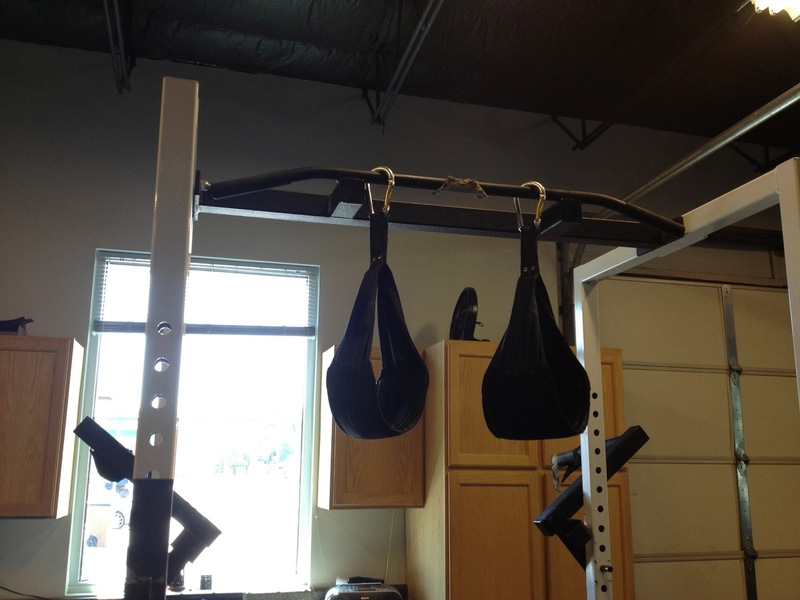 From there, we had two familiar exercises, the 360 and the ARx pulldown. There were a few new bonus exercises, which, as usual, I did 3 times through each. One was the Zottman curl. I used a 10 and 15 pound weight for this exercise where you do about half a regular dumbbell curl before rotating your hands to face the floor and lowering the weight. Another bonus was a diamond push-up. I did mine putting my hands on a bench. You literally put your hands together in a diamond shape and do a push up. Matthew reminded me to lower my body toward my hands not my head toward my hands. And the final bonus was my favorite, the jumping pull up. Matthew had us using a mixed grip on these. I jumped and pulled and held with all that I had. I'll get there. The last exercise in the circuit for me was the hip press. Matthew stayed at the hip press station to coach everyone and adjust the weight for each of us. On the first time through, after about 5 reps, he had me hold the weight at the top, and he put on another plate. That was an odd feeling. I was lifting 245 pounds. At the end of the workout, some of the guys were challenging Matthew to a dips for time challenge. My partner then asks me if I want to hold the top of a dip for 30 seconds. Ok, sure. After doing the workout and the bonuses, my arms were shaking after about 10 seconds. I held it for about 50 seconds. I was going to try to do a little upper range dip movement after the 30 second mark, but I didn't have it in me. The one on one workout this week was the most intense workout I've experienced so far. Matthew explained that its designed to be hard. The thrusters work everything. Then the pulldowns work the back but also the chest and upper abs. You end that with the knee ups and you've hit the lower abs. Each successive exercise builds on the last. Each exercise is hard with the end result of extreme fatigue, at least, for me. After the group exercise, I was telling Matthew about my disappointment in my step up performance and he reminded me that it was the 3rd leg exercise in the workout. 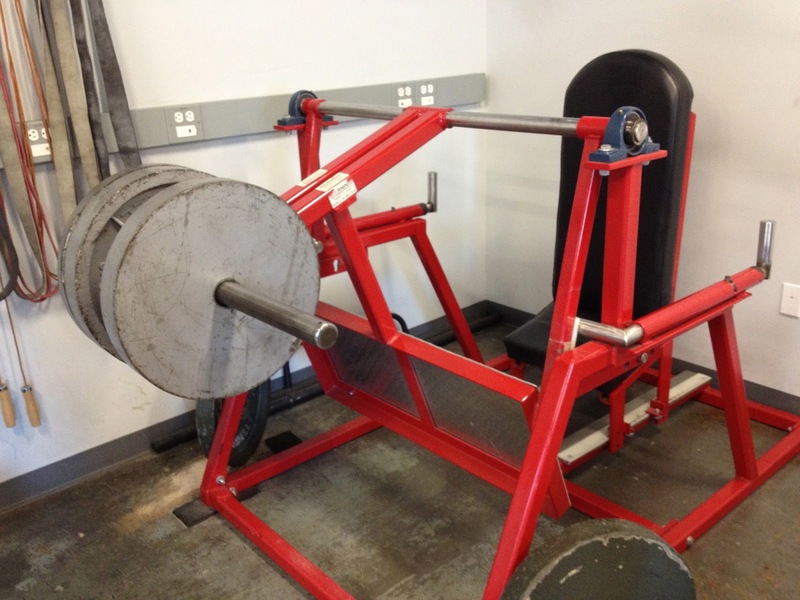 Even if my legs are weak, this is exactly what I need to do to make them stronger. The one on one workout was humbling and presented a mental challenge. I wasn't prepared to do the number of reps that I was expected to do and I think that caused me to fall apart toward the end. I need to work on my mental toughness and be ready. Recommended Reading: When I'm looking for advice regarding a fitness topic, I always look for whether or not Keith Norris has talked about it anywhere. On mental toughness, I found this article where he gives a few suggestions to the average joe trainee. He says, "the name of the game is to make the most you can with what you've got." I'm going to keep trying to do that. How have you worked on your mental toughness in the gym?